ww2dbaseSubmarine tender USS Proteus entered service in Jan 1944. She held her shakedown cruise off San Diego, California, United States. Between May and Dec 1944, she served in Midway with Submarine Squadron 20; at Midway she completed 51 voyage repairs and 14 refits for submarines. Between Feb and Aug 1945, she served at Guam, completing 4 voyage repairs and 24 refits. Between Aug and Oct 1945, after the end of the Pacific War, she served in Japan to support submarines of the naval occupation force. During this time, she also repaired and/or demilitarized Japanese submarines, torpedo boats, and special attack vessels at Yokosuka and other locations in the Sagami Bay-Tokyo Bay areas. ww2dbaseUSS Proteus was decommissioned from naval service in 1947, but would remain operational for services at the submarine base in New London, Connecticut, United States. In 1959, at Charleston Navy Yard, North Charleston, South Carolina, United States, she was lengthened by 44-feet while being converted to support Polaris Fleet Ballistic Missile submarines. Upon completion, she was recommissioned into service in Jul 1960. After a shakedown cruise at Guantanamo Bay, Cuba, she returned to New London to assume her new role. She completed her first refit of a ballistic missile submarine between 20 Jan and 21 Feb 1961 before moving on to Fleet Ballistic Missile Refit Site One, a US Navy submarine base located at Holy Loch, Scotland, United Kingdom. At Holy Loch, she completed 38 refits and would receive a Navy Unit Commendation. 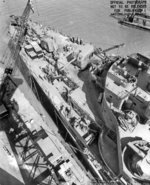 She returned to Charleston Navy Yard for overhaul in 1963, and then returned to Europe briefly; during this time, she helped establish Fleet Ballistic Missile Refit Site Two in Rota, Spain. After refitting in Charleston Navy Yard, she sailed to Guam, arriving in late Nov 1964, to help establish Fleet Ballistic Missile Refit Site Three at Apra Harbor. In 1968, she was replaced by USS Hunley for five months as she performed a self-overhaul at Apra Harbor. In 1971, she departed Apra Harbor for Pearl Harbor, Hawaii, United States and then to Mare Island Navy Yard in California, United States for an extensive overhaul. After a post-overhaul shakedown cruise off Pearl Harbor and a brief visit to Sydney, Australia, she returned to Apra Harbor in mid-Jan 1973 to resume her previous role, relieving USS Hunley. In 1974, her 5-inch gun turrets were removed. For one week in 1975, over 1,000 members of her crew helped in the construction of a refugee camp at Orote Point, Guam for Vietnamese refugees while a very small crew remained on board to continue serving USS Proteus' main mission; for the accomplishments during this week, s 1994 Proteus was re-commissioned yet again as a Berthing Auxiliary and placed in service at Puget Sound Naval Shipyard, Bremerton, Washington. At this time Proteus took on the new naval designation Miscellaneous Unclassified IX-518. he was awarded the Meritorious Unit Commendation by Secretary of the Navy J. William Middendorf. In 1976, she assisted in relief efforts after Typhoon Pamela. In 1977, she was awarded two Navy Humanitarian Service Medals for the 1975 work with Vietnamese refugees and the 1976 work with Typhoon Pamela survivors. Between 1978 and 1980, she was at Long Beach Naval Shipyard on Terminal Island, California, United States for overhaul. After the completion of the overhaul, she returned to Guam, once again relieving USS Hunley. In Sep 1981, she was transferred to Submarine Group 7 as the final squadron she serviced, Submarine Squadron 15, stood down. She departed Guam in Nov 1981 for British-controlled Diego Garcia Atoll in the Indian Ocean. In May 1982, she returned to Guam after making port calls at Fremantle Australia and Subic Bay, Philippines. She visited Subic Bay once again in the fall of 1983. In Nov 1983, she made port call at Hong Kong before returning to Guam in Dec 1983. In mid-1984, she made port calls at Singapore; Perth, Australia; and Darwin, Australia en route to Diego Garcia, where she would remain from May through Sep 1984. She was decommissioned from service for the second time in Sep 1992. In 1994, she was recommission for the third and final time with the designation number of IX-518. After five years of service as a berthing auxiliary at Puget Sound Naval Shipyard at Bremerton, Washington, United States, she was decommissioned for the final time. Between Sep 1999 and late 2007, she was located at the National Defense Reserve Fleet at Suisun Bay, California. She was towed to the facilities of Esco Marine in Brownsville, Texas, United States before the end of the year for scrapping, which would be completed in early 2008. 15 Sep 1941 The keel of Proteus was laid down by the Moore Dry Dock Company in Oakland, California, United States. 12 Nov 1942 Proteus was launched at the Moore Dry Dock Company in Oakland, California, United States, sponsored by the wife of Rear Admiral Charles M. Cooke, Jr.
31 Jan 1944 USS Proteus was commissioned into service with Captain Robert W. Berry in command. 2 Mar 1944 USS Proteus entered Mare Island Navy Yard, Vallejo, California, United States for repairs. 19 Mar 1944 USS Proteus exited Mare Island Navy Yard, Vallejo, California, United States and departed for Midway. 3 May 1944 USS Proteus arrived at Midway Atoll and joined Submarine Squadron 20. 12 Sep 1944 Captain Charles N. Day was made the commanding officer of USS Proteus, replacing Captain Robert Berry. 1 Dec 1944 USS Proteus departed Midway Atoll. 4 Dec 1944 USS Proteus arrived at Pearl Harbor, US Territory of Hawaii. 5 Feb 1945 USS Proteus departed Pearl Harbor, US Territory of Hawaii. 7 Aug 1945 USS Proteus departed Apra Harbor, Guam. 28 Aug 1945 USS Proteus, while in Sagami Bay, Japan, was attached to Submarine Squadron 20. 4 Sep 1945 Captain James A. Jordan was made the commanding officer of USS Proteus, replacing Captain Charles Day. 1 Nov 1945 USS Proteus departed Japan. 6 Dec 1945 USS Proteus transited the Panama Canal. 16 Dec 1945 USS Proteus arrived at New London, Connecticut, United States. 27 Apr 1947 Captain Richard C. Lake was made the commanding officer of USS Proteus, replacing Captain James Jordan. 26 Sep 1947 USS Proteus was decommissioned from US Navy service but remained operational at New London, Connecticut, United States. 15 Jan 1959 Proteus entered Charleston Navy Yard, North Charleston, South Carolina, United States for lengthening and for conversion to a tender for Polaris Fleet Ballistic Missile submarines. 8 Jul 1960 Captain Richard Laning was made the commanding officer of USS Proteus. 8 Jul 1960 USS Proteus was recommissioned into service. 20 Jan 1961 USS Proteus began her first refitting of a ballistic missile submarine at New London, Connecticut, United States. 21 Feb 1961 USS Proteus completed her first refitting of a ballistic missile submarine at New London, Connecticut, United States. 3 Mar 1961 USS Proteus arrived at the US Navy base named Fleet Ballistic Missile Refit Site One at Holy Loch, Scotland, United Kingdom. 12 Mar 1962 USS Proteus suffered an accidental fire during a training cruise in the Irish Sea. 25 Aug 1962 Captain Raymond F. Dubois was made the commanding officer of USS Proteus, replacing Captain Richard Laning. 7 Sep 1963 Captain Lindsay C. McCarty was made the commanding officer of USS Proteus, replacing Captain Raymond Dubois. 2 Jan 1964 USS Proteus arrived at the US Navy base named Fleet Ballistic Missile Refit Site One at Holy Loch, Scotland, United Kingdom. 24 Feb 1964 USS Proteus arrived at Rota, Spain to assist in the establishment of Fleet Ballistic Missile Refit Site Two. 12 Apr 1964 USS Proteus arrived at the US Navy base named Fleet Ballistic Missile Refit Site One at Holy Loch, Scotland, United Kingdom. 29 Jun 1964 USS Proteus arrived at Charleston Navy Yard, North Charleston, South Carolina, United States. 16 Oct 1964 USS Proteus departed Charleston Navy Yard, North Charleston, South Carolina, United States. 29 Nov 1964 USS Proteus arrived in Apra Harbor, Guam to assist in the establishment of Fleet Ballistic Missile Refit Site Three. 16 Jan 1965 Captain Robert H. Gulmon was made the commanding officer of USS Proteus, replacing Captain Lindsay McCarty. 14 Jul 1966 Captain Daniel C. Clements was made the commanding officer of USS Proteus, replacing Captain Robert Gulmon. 6 Sep 1967 Captain Fred T. Berry was made the commanding officer of USS Proteus, replacing Captain Daniel Clements. 6 Aug 1968 Captain R. M. Weidman, Jr. was made the commanding officer of USS Proteus, replacing Captain Fred Berry. 10 Apr 1970 Captain Frank A. Thurtell was made the commanding officer of USS Proteus, replacing Captain R. M. Wiedman, Jr.
21 Sep 1971 Captain John T. Rigsbee was made the commanding officer of USS Proteus, replacing Captain Frank Thurtell. 2 Dec 1972 USS Proteus suffered an accidental boiler room explosion while at Pearl Harbor, Hawaii, United States. 6 Mar 1974 Captain Marvin S. Greer, Jr. was made the commanding officer of USS Proteus, replacing Captain John Rigsbee. 8 Jun 1976 Captain Clifton G. Foster was made the commanding officer of USS Proteus, replacing Captain Marvin Greer. 6 Jun 1978 Captain Thomas R. Fox was made the commanding officer of USS Proteus, replacing Captain Clifton Foster. 7 Aug 1980 Captain Michael C. Colley was made the commanding officer of USS Proteus, replacing Captain Thomas Fox. 21 Oct 1981 USS Proteus was awarded the Battle E Efficiency. 22 Dec 1981 USS Proteus crossed the Equator en route to Diego Garcia in the Indian Ocean. 18 Jun 1982 Captain J. Stephen Perry was made the commanding officer of USS Proteus, replacing Captain Michael Colley. 9 Dec 1983 USS Proteus arrived at Apra Harbor, Guam. 17 Jul 1984 Captain Herndon A. Oliver III was made the commanding officer of USS Proteus, replacing Captain J. Stephen Perry. 10 Nov 1986 Captain Paul W. Middents was made the commanding officer of USS Proteus, replacing Captain Herndon Oliver III. 1 Sep 1988 Captain Edward R. Losure, Jr. was made the commanding officer of USS Proteus, replacing Captain Paul Middents. 16 Aug 1990 Captain William A. Evans IV was made the commanding officer of USS Proteus, replacing Captain Edward Losure, Jr.
13 Mar 2001 Proteus was struck from the US Naval Registrar. Proteus was my first duty station upon my graduation from "A" school in the spring of 1972. She was at Mare Island undergoing a major overhaul. One of the upgrades she received was replacement of her old GM diesels with modern Electro-Motive diesels. I rode the ship from Mare Island to Guam via the international dateline and Sydney Australia. To Doug Humble: Thank you for pointing out the misspelling. It has been corrected.